The Celebrity Elite Plus and Celebrity Elite series build on the classic multi-sound hole instrument design of the Clebrity Elite guitars, upgrading the Plus models with select figured tops, beautiful abalone appointments, and first-rate sound, style, and features. This series includes the Super Shallow Lyrachord body shape which includes the Elite multi-sound hole design, providing clear highs, as well as focused and balanced bass response. For the top's quartersawn scalloped "X" bracing, Ovation reviewed earlier bracing patterns extensively and arrived at a remarkable new design that borrows from the past and is voiced for the present. Together, the body, top and sound holes create the classic Ovation Elite sounds: Resonance and balance, full projection, remarkable note clarity, and nuanced tonal complexity. The top is complete with premium features that include an effortlessly playable satin finish neck, 10" radius rosewood fretboard with 20 fully accesible frets, pearloid inlays, and a rosewood bridge. The Gator RI-GTRSTND single guitar stand will keep your guitar out of the way of potential hazards that could result in damage to your precious instrument. 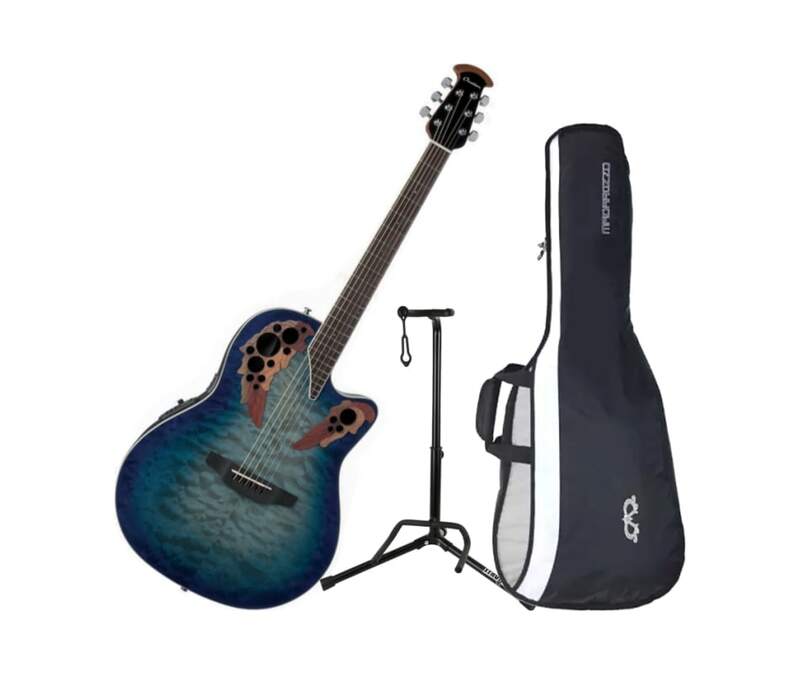 The Gator RI-GTRSTND single guitar stand features finish friendly rubberized cradle padding, a durable neck restraint that secures the guitar on the stand, as well as a robust, heavy-duty steel construction. The Gator RI-GTRSTND also features removable red safety trim on each of the three stand feet. The Frameworks series of stands, including the Gator RI-GTRSTND boasts a wide variety of innovative, reliable products designed to support your music! Gator Cases is known for manufacturing innovative products designed to protect! The Celebrity Elite Plus and Celebrity Elite series build on the classic multi-sound hole instrument design of the Clebrity Elite guitars, upgrading the Plus models with select figured tops, beautiful abalone appointments, and first-rate sound, style, and features. This series includes the Super Shallow Lyrachord body shape which includes the Elite multi-sound hole design, providing clear highs, as well as focused and balanced bass response. For the top's quartersawn scalloped "X" bracing, Ovation reviewed earlier bracing patterns extensively and arrived at a remarkable new design that borrows from the past and is voiced for the present. 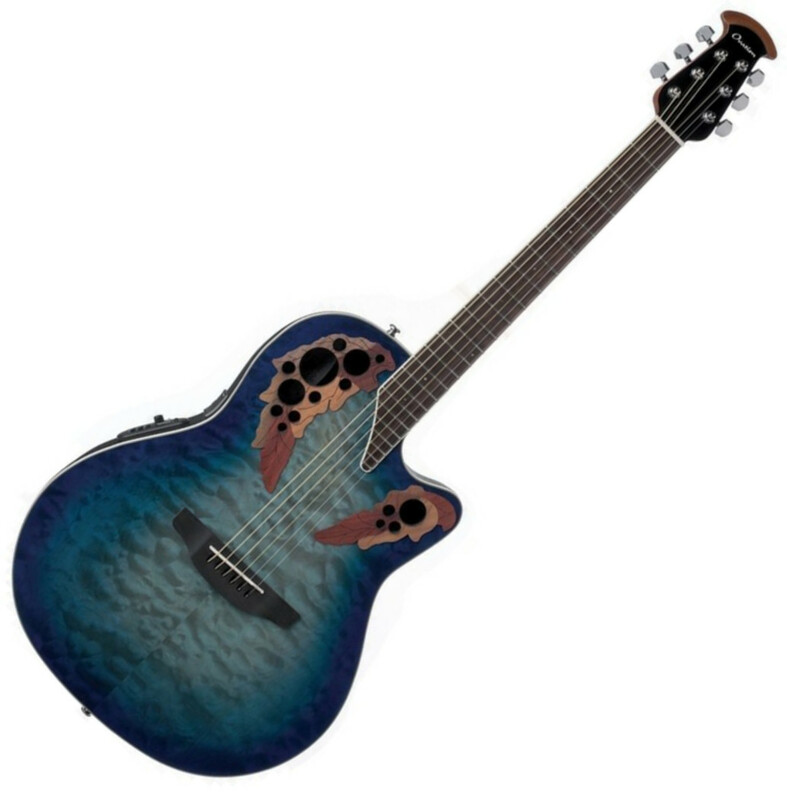 Together, the body, top and sound holes create the classic Ovation Elite sounds: Resonance and balance, full projection, remarkable note clarity, and nuanced tonal complexity. The top is complete with premium features that include an effortlessly playable satin finish neck, 10" radius rosewood fretboard with 20 fully accesible frets, pearloid inlays, and a rosewood bridge.